I have Android 4.3 forced to use Charles proxy via IPTABLES. The charles certificate is installed on the phone. I am able to capture normal SSL traffic like https websites in the browser. All POST and GET methods seem to work fine. In a particular app, it fails when using the SSL CONNECT method. 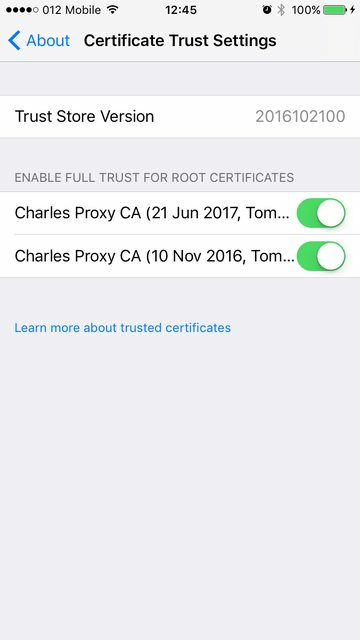 From iOS 10.3 you also need to go to Settings > General > About > Certificate Trust Settings and trust Charles certificate. You can face with this problem at some applications like Facebook or Instagram. Charles certificate doesn't work at some new apps because they are using a technique named as SSL-PINNING. First of all you have to break ssl-pinning system of application or you can instal old version of application then it sometimes works but we need a new solution about ssl pinning in order to record traffic for this kind of applications. In N - you need to also add an xml file and security config. This post goes into more details: How to get charles proxy work with Android 7 nougat? I have met the same problem. And after installing the latest certificate, it is solved. On your phone, visit http://charlesproxy.com/getssl to download the cert. Upon downloading the cert in android, it will prompt you to install the cert, give the cert a name and continue. It should now work. as @Berkay Yıldız says, it probably using ssl/certificate pinning. how to fix/avoid/disable ssl pinning? Couldn't install because the certificate file couldn't be read. The solution to this problem was to install via: Settings > Security > Install from storage After navigating to the cert file and installing it everything worked as expected. If you get this with an app using facebook login on an android phone, I got around it by uninstalling the fb app. Then the mobile fb web is used instead and I can charles everything. With the fb app installed the fb api fails with SSL error. I am using Charles 4.2.5 and Nexus 6P on Android 8.1. One cannot use Charles to track https on my mobile phone. Plz note that after Android N, we cannot capture normal SSL traffic of others'app. Android As of Android N, you need to add configuration to your app in order to have it trust the SSL certificates generated by Charles SSL Proxying. This means that you can only use SSL Proxying with apps that you control. In order to configure your app to trust Charles, you need to add a Network Security Configuration File to your app. This file can override the system default, enabling your app to trust user installed CA certificates (e.g. the Charles Root Certificate). You can specify that this only applies in debug builds of your application, so that production builds use the default trust profile. Not the answer you're looking for? Browse other questions tagged ssl proxy iptables charles-proxy or ask your own question. How to get charles proxy work with Android 7 nougat? SSL Proxy with Genymotion and Charles? How to proxy requests to api.twitter.com including SSL certificates? Why some iphone apps won't finish ssl handshake with Charles Proxy? How to get Charles working with Xcode 7 on SSL connections? Is this Half-dragon Quaggoth boss monster balanced?